The outcome of every interaction between horses and humans, both in-hand and under-saddle, depends on a horse’s mental abilities, its instinctive tendencies, its learning processes and its biomechanical potentials. In this excerpt from their book, Academic Horse Training, Dr Andrew and Manuela McLean describe these aspects of horse behaviour and then show horse owners how to develop them into trained responses, providing a most important foundation for their understanding. In terms of mental ability, humans are unique. This is largely a result of the elaborate development of the front region of our brains called the pre-frontal cortex. This is the seat of imagination, abstract thought, planning, reminiscing and the site where we organise elements of the world into symbolic language. These abilities are so important to us that it is understandable that we look for, and perhaps long to discover, similar abilities in animals. 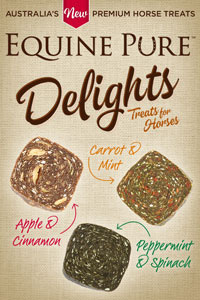 Horses also have some outstanding mental abilities that have evolved to fulfil the needs of a herbivorous prey species. What sets humans apart from horses is largely the extent of higher mental processes. While horses have some rudimentary reasoning processes, such as abilities in stimulus generalisation, being able to learn categories of information and restricted abilities in learning by observing the behaviour of others, the higher executive functions of the human brain are out of their league. Understanding the horse’s brain is important, as there are negative welfare implications in both overestimating and underestimating its mental abilities. In times gone past it was very common to underestimate a horse’s mental abilities. 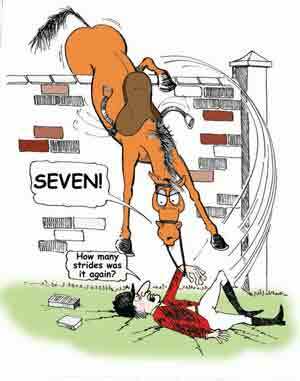 This often led to a lack of empathy with the horse and to overly harsh punishment. Nowadays the pendulum has swung the other way and the vast majority of horse-people tend to overestimate the mental abilities of horses. The dangers here are more subtle but still significant. Overestimating equine cognitive abilities (the mental process of acquiring knowledge and understanding through thought, experience and the senses) can give tacit approval to poor timing of signals and reinforcement (‘He knows what I am asking for, he’s just being stubborn!’). It can also encourage delayed punishment (‘He knows what he did wrong!’) and other detrimental and ineffective training practices. It is common for horse-people to compare the supposed intelligence of horses, however, this is a far more difficult thing to do than it would at first seem. Usually the comparison is made with regard to how fast the horse learns certain things in training, a test that is essentially based on how the horse responds to the aids, or how it reacts to body pressure. 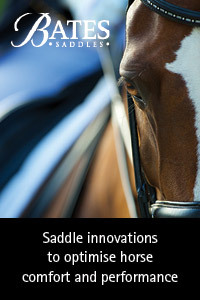 So the question of intelligence is really only a test of how motivated the horse is to respond to pressure on its body. 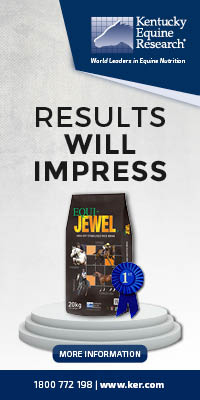 The horse that seems less intelligent in that regard is often outstanding when the motivation is changed, such as to food or some other attractive stimulus. All that can safely be commented on in any comparative sense is differences in motivation. In addition, horse training does not test ‘intelligence’ in the sense of higher mental abilities, but simply taps into some basic hard-wired learning systems in non-associative and associative learning. 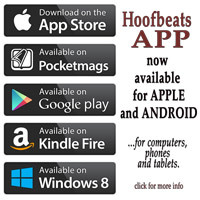 The vast majority of horse-people tend to overestimate the mental abilities of horses. The horse is a highly social animal, which explains why those kept in isolation are more likely to show separation anxiety and stereotypies (wind-sucking, crib-biting and weaving) than those kept in group-housing conditions. Companionship is important to horses. So strong is the instinct for togetherness that grooming each other at the base of the neck is almost immediately relaxing. 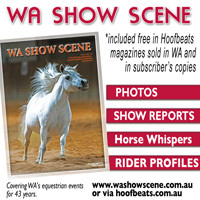 Research shows that grooming and stroking horses just in front of the withers causes a significant lowering of heart rate compared to any other region. Grooming there lowers heart rate and strengthens bonds, so it is the optimal site to positively reinforce a horse with tactile rewards. Most New Age training methods assume that the interactions between horses and humans are similar to interactions between horses. At first glance the claim that leadership, respect, dominance and submission ‘attitudes’ account for the quality of horse/human interactions may seem plausible, but equine scientists do not find this argument convincing. Thousands of hours spent researching equine social organisation show that the so-called pecking-order is complex and dynamic. Individual horses are often apparently dominant in one setting or for one resource and then not in another. Their motivation to out-compete others for particular resources (such as food or mating rights) is likely to have a learned component. The idea of dominance and submission personality groupings is far too simplistic to be of any useful value. each other at the base of the neck is almost immediately relaxing. strengthens bonds, so it is the optimal site to positive reinforcement. Horses do not do things for humans because they sense strong human leadership. They learn to do things as a result of the reinforcement of certain responses, not because their trainers stood tall and looked impressive. For example, the horse that does not load into the float/trailer does not refuse because he doesn’t trust or respect you or because he sees your leadership as weak. He refuses because his training of the go response in-hand is not deep enough for him to lead wherever you point him. 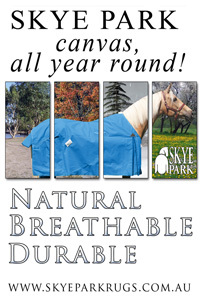 It doesn’t matter to the horse if you are small, round-shouldered and introverted. 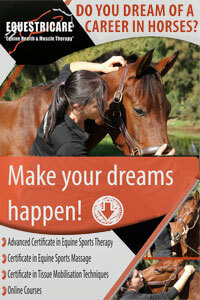 What matters is what and how you train the horse. It is unlikely that horses view humans as part of their herd structure. It may never be fully understand how horses view their world, but it seems unlikely that they would ever have evolved a capacity to include a predatory mammal such as a human as part of their herd dynamics. Genetic make-up and behavioural history, not ‘willingness’, is why horses differ in the responses they offer to training. 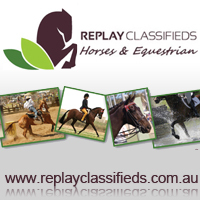 Some training ideologies emphasise the need to ‘gain respect’ from a horse on the ground. They may describe the horse as having no ‘ground manners’ or that he lacks ‘respect’. These notions of ‘respect’ and ‘manners’ are human centred terms and are not helpful for retraining problem behaviours in horses as they can lead to the use of punishment and techniques that have nothing to do with the offending behaviour. It is more helpful (and safer) for handlers to focus on having respect for how the horse learns rather than to focus on seeking respect from the horse. For example, when a horse is barging into your space, pushing you or stepping on your toes, don’t interpret this as a lack of respect or his pecking-order dominance, but instead think of it as a series of incorrect learned responses. 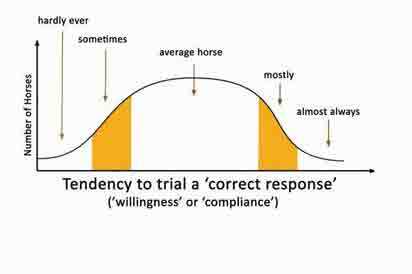 Ask yourself: ‘What rewards this behaviour?’ Optimal horse welfare and the most effective training arise when you interpret such issues as a lack of basic training of learned responses. Knowledge of learning theory gives you a powerful tool-box of training principles that will enable you to train effectively and to resolve problems. The horse has an excellent memory that may, in some respects, be superior to human memory. While our memory can be altered by our ability to recall situations and our reasoning abilities, the memory of the horse is more stable, probably because it is unclouded by reflection. In humans, our elaborate prefrontal cortex allows us to constantly trawl through our memories, reliving experiences personally and in storytelling. These memories are thus altered and corrupted when we restore them in our brains. The law courts are constantly dealing with memory flaws in humans. On the other hand, horses have excellent and quite precise memories. Research shows that they can remember precise learned responses without practice for long periods of time. Once a horse has learned to fiddle with the gate latch and open the gate, he can remember it for years without practice! It is worth pondering just what such a powerful memory may have stored in all your interactions with him. While the horse’s memory of its physical world and of associations is excellent, there are limitations to its immediate recall compared to humans. This is most likely because of the advantage to humans conferred by the prefrontal cortex, which allows us to have object permanence whereby we can visualize and imagine present and past in our ‘mind’s eye’. This ability gives us some short-term memory advantages – we can look back in time easily and mentally repeat things to ourselves. Horses have difficulty with some aspects of retrospective and prospective memory, and this informs trainers that correct timing of reinforcements (rewards) is essential. It may well be the reason that non-contingent punishment (punishment that isn’t connected in time to the offence) is ineffective in horses. One effect of such a keen memory is that the horse remembers precise details of events and doesn’t generalise immediately. When you train the horse to go forward in one place, he associates all the details of that place with that reaction. So in the very early stages of training, he learns that going forward is not only associated with the rider’s ‘go’ aids but also with the visual surroundings. Train him to go onto a water obstacle and you think he has now learned water obstacles, but the next one differs from the first and he grinds to a halt. 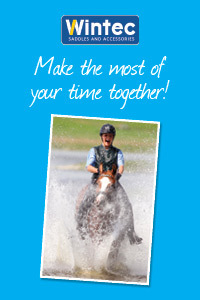 The average horse must be trained to go into at least five different water obstacles before he can fully generalise. So now he should go into any water obstacle. It is a little like holding up five transparent photos of five different water obstacles: generalisation occurs when the only common denominator is the water – all the other details are blurred. Recent studies from Denmark show that generalisation occurs much faster if one common denominator remains when horses are exposed to new environmental stimuli. This informs trainers that when introducing a horse to new places or to new responses, it helps to maintain some old familiar features, such as establishing a response in one place first. 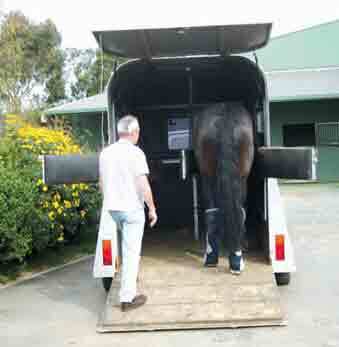 It is worth remembering that even with trailer loading, most horses will baulk when presented with a different trailer to load in after experiencing loading into only one. 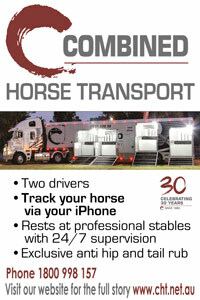 The rule of five is a fairly general guide to the number of different environmental stimuli, such as trailers, that it takes for a horse to generalise. Context-specific learning can be a hindrance to training if the horse learns to demonstrate flight-response behaviours in certain locations. The horse learns tense and fearful responses more rapidly and they are more indelible than other responses. Sometimes it takes just one or two episodes of a flight response to cause repetition in the same contexts. These fear memories can be suppressed and thus made less retrievable with correct training, but in the right circumstances, the response can return with alarming speed and accuracy (this is known as spontaneous recovery). For this reason it is an essential principle that flight-response behaviours should be properly identified and training schemes should be tailored to avoid them at all costs. Every horse is different. 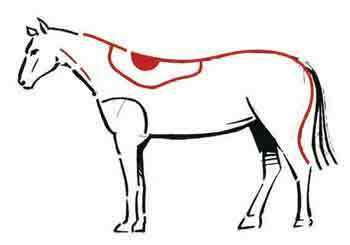 All horses vary in their genetic potential. Some may ‘trial’ certain behaviours such as bucking, or they may be oversensitive to pressures, or less sensitive and prone to what some might call ‘laziness’. These are learned responses, not personality disorders. Whatever the genetic potential, training can confirm or deny these behaviours, and their potential to escalate. Early training is therefore critical in targeting the correct responses and resolving tension so that undesirable behaviour is not practiced and never becomes a habit. It is incorrectly believed by some that because all horses are different, they require different techniques of training. The truth is, however, that all horses learn to respond to leg or rein pressures by the same processes, so training should tap into these learning processes. Differences among horses are accounted for by differences only in the amount of pressure required to produce responses as well as the number of repetitions. Some aspects of training require more emphasis than others. These differences are not related to the horses’ intelligence, but to their inherited and learned sensitivity. 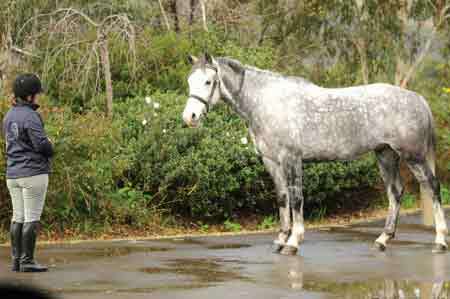 Horses also vary in the types of responses they offer. This is not related to their ‘willingness’ but to their genetic makeup and their behavioural history. 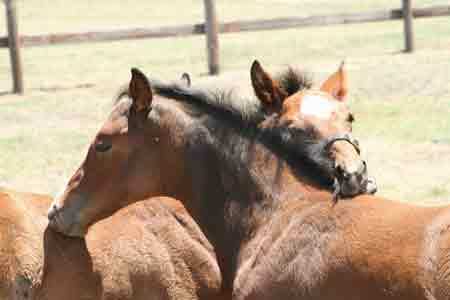 Some horses give opposing responses to conventional aids. 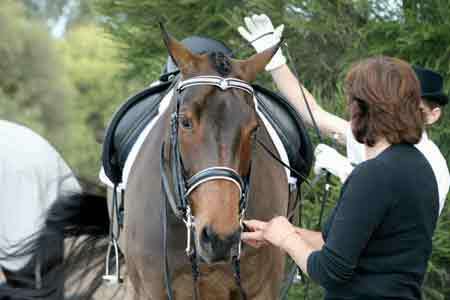 For example, some horses have learned to panic or simply not respond when the reins are used to stop. 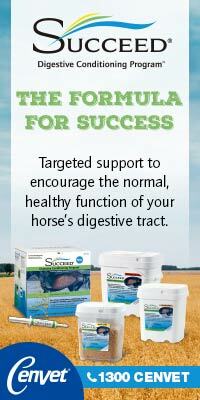 So, for the horse to be reliable and relaxed under all circumstances he will need his rein responses retrained. Not all horses are suitable for all riders. You must think carefully and be frank with yourself about your abilities. Extravagant movement may be attractive but it sometimes comes at a cost because such horses are often very sensitive and difficult to train. Most riders will go further with an average mover that is trainable and is easier to ride. Finally, less-skilled riders faced with the prospect of retraining a horse that has developed dangerous behaviour should bear in mind that compatibility is more important than love when it comes to horse/human relationships. 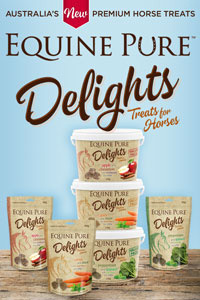 Andrew is a presenter at Equitana Australia, from the 18th to the 22nd November 2010, at the Melbourne Showgrounds. 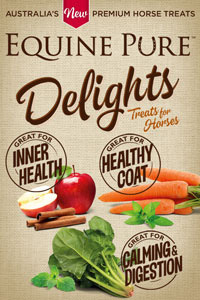 www.equitana.com.au.